I really like the sunburst blue dialled one with the red hand. There's also going to be a limited edition black dialled one with yellow accents. Agreed! If I could choose, not sure which I would go for. Maybe the GMT, because it makes so much more sense as a quartz. I found it a pain constantly resetting the hi beat GMT I had. And while at it, five-year guarantees. They need to offer more for the money. Interesting specs. Unfortunately I don't like the Longines designs but do like the GS ones. The Longines heritage models are nice though. Could it not be that GS are more conservative with their guarantees for accuracy and battery life, and in reality, theirs are actually up there with Longines? And while they're at it, an independently adjustable hour hand. 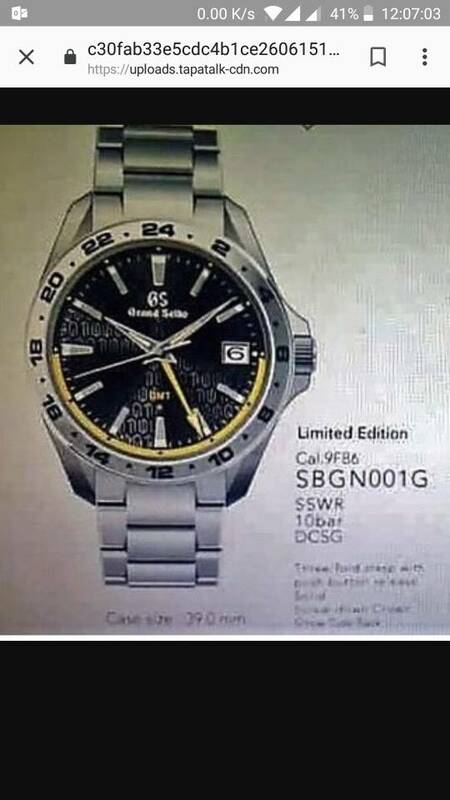 I wonder if these new models will have that, after all it is a new movement, the first quartz GS GMT movement as far as I know and the hi beat GMTs have independently adjustable hour hands. The SBGV247, I like, and I'm a big fan of GS, but the bezels on these GMTs (at least in the images above) look pretty ugly. Put Citizen's Chronomaster movement in a GS quartz and you have the perfect watch. My £300 Seiko Sportura GMT has an independent hour hand, sapphire crystal, ceramic bezel and kinetic charging. I've just set the time correctly since the end of March and it had lost 15 seconds. 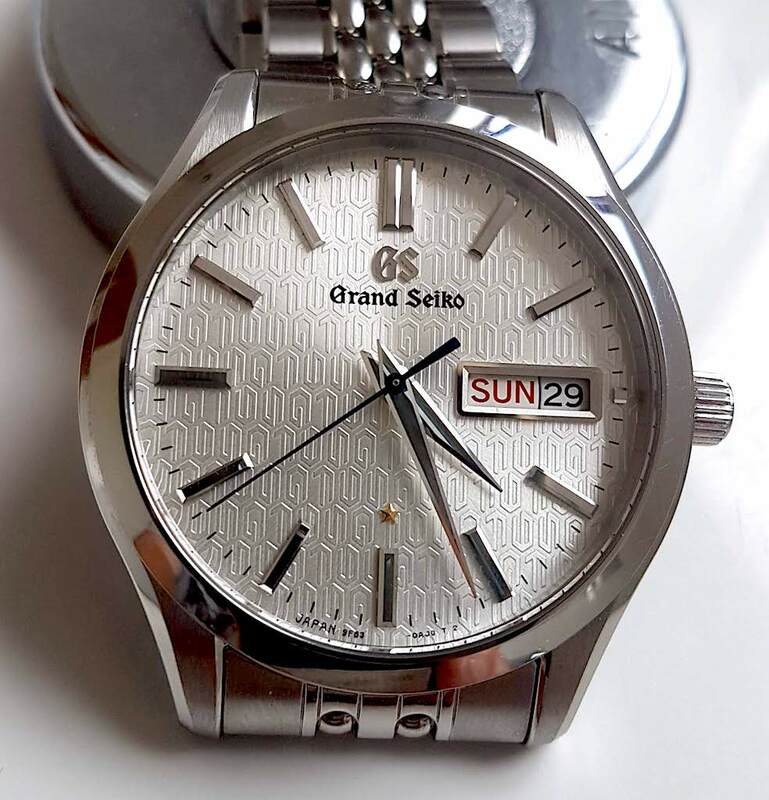 I know GS are superior, but the standard Seiko are so damn good for the money, I can't see how they can justify the extra 0 on all GS models … especially a quartz? No disrespect for the Sportura models (I had one) but quality wise they are miles apart from a GS quartz. Have you had a GS quartz? Would love to see more pics of the quartz GMT. Any idea on prices? Last edited by Watchdude; 11th August 2018 at 12:03. 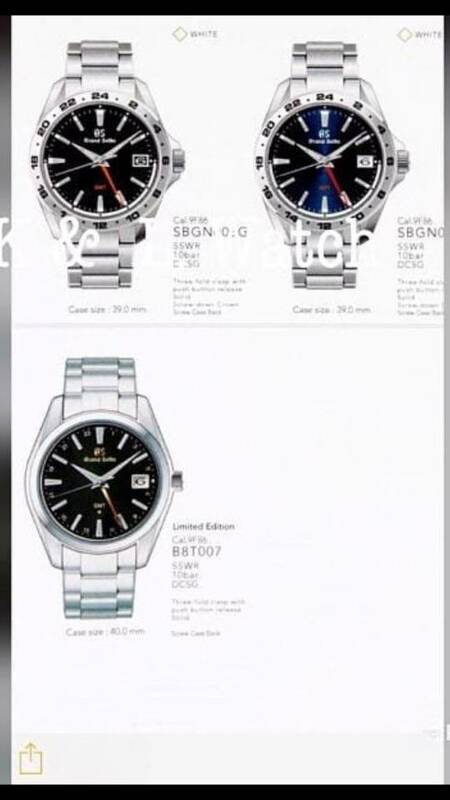 Fantastic, really want to have a look at these; was chatting in the Seiko store a couple of weeks back about them, when collecting my 9F anniversary. I guess price will be towards £4K for the LEs, given the stainless SBGT241 list was £3100. The orange one does something for me. Sadly it looks a bit too much like my Explorer 2 (albeit better looking). I'm really liking where Seiko are going with the GS line these days. I thought, we both knew, that they effectively have done...........with this...? It's an f9 movement with a selected sample of quartz; bit of marketing really. They do the same on limited editions of the spring-drive. But it claims the "5 Sec per year" accuracy like the Chronomaster so a bit more than marketing if it be true ? What I meant was that the differences in precision are so small.....five seconds a year...that they don't really matter, but they do sound good in adverts. Presumably, it would be theoretically possible to get down to, say, one second a year. That I'd like to see. Just for the fun of it. Both my Spring Drive and "regular" 9f watches are out by no more than 2sec per year, I'd say that's pretty accurate and a damn sight more so than Seiko themselves state. Good move by GS to introduce quartz GMTs, as this thread has shown there'll be a market for them. GS are exemplary in their finish and are in my view the ne plus ultra of quartz watches. However, I recognise and agree fully with the comments re Sportura; it’s an almost text book example of the 80/20 Pareto Principle in terms of the quality and the value. It doesn’t diminish the GS line to recognise the quality of the Sportura line. Tbh, I'd be far more interested in having a perpetual calendar and IAHH than an improvement in accuracy to 5spy. Judging from many users' experience, it seems that the 9F runs within 5spy already so I suspect Seiko like to err on the side of caution in their claims. Well, Citizen have just done so in a pocket watch with talk of it being extended to wristwatches so we may not have to wait too long. 1spy would be pretty cool. I believe stated accuracy is now 5 secs per year as opposed to ten secs (if that sort of gain in accuracy even matters). Can see a strong cult following for these. An independently adjustable hour hand for the GMT would resolve an omission from the 9F series, and bring back the functionality previously offered by the 8J GS movements. Note that there is no summer time equivalent in Japan (recall GS was originally JDM) so it is less of an issue here. You set your GS quartz and forget it, unless travelling. Summer time is however being considered for the 2020 Tokyo Olympics, so it may be opportune timing. - It requires some method of re-setting and verifying the year after battery changes or maintenance, which can be difficult. Extra holes in the case, or electrical contacts on the movement to be tapped in sequence (as per Seiko's own 8F56) are two solutions, neither of which I'd like to see on a Grand Seiko. All the Citizens have an extra hole in the case, I believe. Not so elegant. - It usually means the date change is decoupled mechanically from the movement, permitting some trickery in visually confirming the leap year by, for example, spinning the date wheel around electrically (as per the 8F56) with a micro motor, or moving the second hand. Another "no thanks" from me. I prefer mechanical coupling and would happily advance the adjustable hour hand a few revolutions if necessary. Last edited by Tokyo Tokei; 11th August 2018 at 22:58. Interesting points about the 8F56, I didn't notice the perpetual calendar being a particular advantage on it although the independently adjustable hour hand is, especially for travelling. Longines seem to have faced the issues of battery life and a perpetual calendar. You get about six months warning, and the watch goes into 'sleep' mode for another six months. During that period the watch 'remembers' the calendar. So you have plenty of time to get the battery fixed. ETA designed this new module and it's pretty clever. Time for Grand Seiko to upgrade. Twenty-five years is a long period , in technological terms. For now, the Swiss lead the way. Fancy that. Last edited by paskinner; 11th August 2018 at 19:21. Yes, I'm not for one minute suggesting that GS are not worthy of their price tag, merely suggesting the standard Seiko's just make them look too pricey. Every prospective GS buyer has to overcome this hurdle … most couldn't, including myself. I would compare GS to their Swiss rivals and find GS far better value for money. But I agree Seiko are even better value. I've been waiting for these to be released, a sporty quartz GMT really makes a lot of sense. For me it would have to be the blue dial. Any idea when these will be released? What is the model number of the blue variant? As did Seiko over a decade ago with the 8f56 - 20 seconds per year accuracy, GMT hand, independently adjustable 12 hour hand, perpetual calendar and 10 year battery life. It's not all about the specs. Neither the 8F56 nor the Longines/ETA movement is suitable for a Grand Seiko. The London Seiko boutique said October this year. No-one is suggesting that GS use the ETA module. The point is that 25 years ago, the F9 was the industry state-of-the-art. Now it isn't. Or is the F9 a 'perfect' quartz module? Last edited by paskinner; 11th August 2018 at 21:59. Thanks, excited to see these in person. Particularly the B8t007. Really excited about these - everything I want in a watch! I'd agree with that. Regular Seiko offers stupendous value, and with the development of their 'Presage' lines the gap between Seiko and GS has perhaps been bridged a little. I do think Seiko tend to make nearly everything else look poorer value by comparison. However, there is a large amount of extra work (dials), hand-assembly (9F Quartz movements included) & hand-finishing (cases, indices etc.) which make GS a higher-class proposition, amongst other little touches. Speaking for myself, those are details that I don't think can be fully-appreciated until you have one in-hand. It's like taking a loupe to the razor edged & highly-polished hands & indices - unless you look a bit closer and experience them in person, the full scale of GS' efforts can sometimes go a little under appreciated in casual observation. Everyone has their preferred 'sweet spot' however, where levels of quality & pricing come together most favourably.